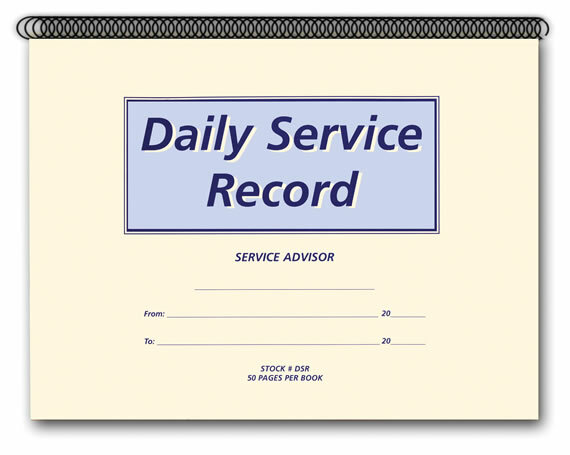 This is the Daily Service Record book that your service advisor really needs! Compact, yet it has all the critical information required to coordinate all service work. Starting with scheduling all service appointments in advance, information from the time in, through completion of work, notifying customer, and delivery of vehicle. Legally, repair shops may be required to produce notes on authorized additional repairs. Your dealership's service advisors or writers can now have all the information needed. Keep it in this compact book and file it away for further reference if necessary. This convenient Daily Service Record book is coil-bound with heavy metal binding and printed on heavy 90lb. white index paper stock. Cover and back on heavy 15 gauge manila paper stock. This Daily Service Record book always lays flat on desk regardless of what page you are working with. Printed on both sides, there are 50 pages per Daily Service Record book. COMPARE OUR PRICE to Great American Automotive Products. THEY'RE MORE EXPENSIVE … American's Price is 1 Book @ $22.00 - DSR54 … for the same Daily Service Record Book.